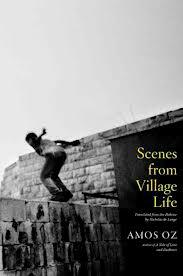 In the fictional village of Tel Ilan, situated in the hills of Menashe south and east of Haifa, times are changing – actually times have been changing for awhile. This book is comprised of eight subtly interwoven stories about the lives of kinda-sorta average people, with a deep vein of strangeness in the manner of the “grotesque,” where the reader identifies with the character, but then realizes there’s a kind of disgust there as well. The characters of one story might wander through the story of another character but oh well, it’s a small town. There is a first person who seems to be the narrator for most of the stories as well as being a character in them, presumably a neighbor, but who is he really? The stories concern property and aging and various forms of love – or at least attachment. I think some of them may have some kind of allegorical element relating to Israel. Stories 1, 3, 4, have more to do with property while stories 2, 5 and 6 have more to do with love. 1. In “Heirs,” Aries Zelnik, the middle-aged protagonist, lives with his aging mother when a strange fat lawyer shows up implying they’re relatives and the estate has to be settled. 2. In “Relations” an aging Dr. Geli Steiner, waits for the nephew she has loved and abused. 5. “Waiting” is the story of a man whose wife sends him a note saying not to worry about her and then she’s not where she is suppose to be at lunch time. He worries. 7. In “Singing” the first person attends a musical party where some of the characters from the prior stories are present. There are a few more backstories told and memories are explored. The names of the Sabbath songs as well as patriotic songs are mentioned and most of them are old songs. The group discusses politics mostly – and it’s announced that the Air Force has successfully bombed the enemy. The first person is sure he’s forgot something in his coat pocket upstairs. The 1st person goes alone to the dark bedroom and finds really old cobwebs and dust – looks under the bed – into despair – perhaps of his childhood, perhaps of the country’s history. 8. The last story is called In a Faraway Place at Another Time – and is totally different in tone and almost everything. I wonder if this is what the 1st person above found under the bed but it’s a different 1st person – in fact there is no one in the story who resembles the characters of the rest of the book. “I am the pharmacist, teacher, notary, arbitrator, nurse, archivist, go-between and mediator.” (p. 177) – He’s not the real estate agent of the prior stories. Is this the same community? It feels like not and the title would indicate that it’s different. This is a community which has shut itself off to the extent they are forgotten by the rest of their country, forget their connections and are scared when someone arrives on the hill, but the stranger (from the east) leaves so they go back to work with the threat that if you don’t work you die. I’m wondering if this could be a Palestinian settlement.